Every enterprise has a long-range plan, but most do not have a strategic data strategy that maps to that long-range plan. A data strategy looks holistically at the needs of a business mapped against the gamut of data that may be available. This mapping leads naturally toward a roadmap of extracting value from data, and how IT architecture must evolve to support that vision. It sounds like a simple process, but the complexities of modern data processing and storage are mind boggling. A data strategy comprehends not just data, but the rapidly changing range of targeted IT solutions for storing and analyzing that data. It’s no longer as simple as plugging in a server and a storage array and loading up an application. There is rapid disruption in the data management space, with traditional storage arrays being supplemented with new architectures such as converged and hyper-converged infrastructure, various flavors of software-defined storage, and cloud and hybrid-cloud storage. Data Inventory: A comprehensive understanding of the attributes and access needs of data being processed and stored. Data Protection: A data retention and protection strategy, defining how various data must be maintained long term to satisfy both corporate needs and governmental regulations. 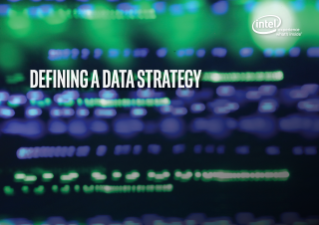 Building a comprehensive data strategy needs to be a key element of any enterprise’s plan for success, but it’s not something that an organization should try and do alone. Build an industry advisory panel. Include technologists from your current partners who provide the key capabilities in enterprise software for your industry today. Engage OEM partners, such as Hewlett-Packard Enterprise*, Cisco Systems*, or Dell EMC*, who are all focused on delivering solutions. It’s also important to engage broader thinkers, who are both powering today’s solutions as well as thinking about the near-term evolution of data storage and compute. In the enterprise data center world, that’s a pretty short list. Partners such as Intel can provide insight into the technologies that exist today and the direction in which those technologies are evolving. Data has become strategic. Managing and processing data has become complex and confusing. Tomorrow’s successful companies will have a data strategy that lives and evolves side by side with their long-term plan. Much like the long-term plan is created with the input of customer advisory panels and other external inputs, a data strategy needs to be informed by the IT leaders supporting your industry.